Golf outing raises $28,500 for ThonGolfers, sponsors, and volunteers collectively raised $28,500 for the Penn State Dance Marathon, also known as THON, while participating in the Brady C. Lucas Golf Outing. 3rd-place finish a shot in the arm for Central A few weeks ago, at the District 3 Class AAA golf championships, Central York finally did what it had been attempting to do – unseat perennial golf power Manheim Township. Lee, Bacha take home PIAA medalsWednesday could be an interesting day for the Central York golfers who will take on the state’s best in the PIAA Class AAA team golf championships. Three YAIAA golfers in top 10 after PIAA first roundThree YAIAA golfers are poised in the top 10 at the end of the first round of the PIAA tournaments on Monday at Heritage Hills. Seven YAIAA golfers advance to PIAA tourneyCentral York juniors Julianne Lee and Joe Parrini once again carded the best rounds among York-Adams golfers Monday afternoon at the PIAA East Regional championships at Golden Oaks Golf Club in Fleetwood. Spring Grove golfers go head-to-headThe final two qualifying spots for the PIAA East Regional for Class 3A were up for grabs at the end of Saturday's District 3 individual golf tournament. 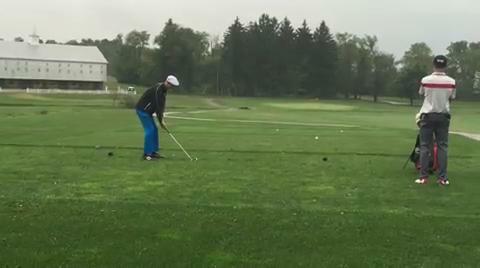 Watch: Bittersweet ending for Spring Grove golf duoLuke Hoffnagle and Mason Staub have been friends and teammates for years, but in a playoff during the District 3 Class 3A individual tournament the two golfers were pitted against one another. Central golfers continue perfect postseasonThe beat goes on for the Central York golf team. Joe Parrini and Julianne Lee both won gold in the District 3 Class 3A individual tournament at Briarwood Golf Club Saturday. Watch: GameTimePA.com Athletes of the Week for Oct. 2See who the top performers were from around GameTimePA.com for the week ending Oct. 2, 2016. Central's magical season continuesAfter watching Manheim Township walk away with a trophy the last two seasons, the Central York golf team said no more. Parrini, Lee keep it going for CentralIt might be a little early to be calling the Central York golf team a dynasty, but the Panthers are well on their way. Watch: YAIAA games to watch, Oct 3-8Here are some of the top YAIAA volleyball, soccer, tennis and golf matches to check out the week of Oct. 3-8.